The coversheet to Beethoven's 5th Symphony. One can see the dedication to Prince Lobkowitz and Count Rasumovsky. Symphony No. 5 in C minor, Op. 67 is a symphony by Ludwig van Beethoven. It is the fifth of his nine symphonies. It was written between 1804 and 1808. This symphony is one of the most popular and well-known works of classical music. There are four movements: an opening sonata allegro, a slower andante, and a fast scherzo which leads straight in to the finale. The symphony was first performed in Vienna's Theater an der Wien in 1808. His Sixth Symphony was also performed for the first time at the same concert. 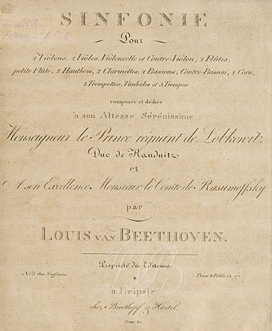 The Fifth Symphony soon became recognized as one of the most important musical works. The opening of the symphony is so famous that it has often been quoted. Other composers have used it in their compositions, e.g. Sergei Rachmaninoff in his song Fate. It has often been used in popular culture, from disco to rock and roll, and in film and television. During World War II, the BBC used the four-note motif to introduce its radio news broadcasts because "short-short-short-long" spells the letter "V" in Morse code. The "V" meant "Victory". It was played very quietly on a drum. People in Nazi occupied countries who wanted to hear the news listened in secret to the BBC news because it was more likely to be true. The third movement of the symphony uses this rhythm sometimes as an accompaniment. Beethoven in 1804, the year he began work on the Fifth Symphony. When Beethoven wrote this symphony he was in his mid-thirties. He was becoming more and more deaf. He found this terribly hard to bear. He thought that he, of all people, should have perfect hearing. He felt very depressed, but he decided not to commit suicide, but to stay alive and write down all the music he had in his head. He wrote about this in a letter called the Heiligenstadt Testament. The opening of the Fifth Symphony sounds very bold and heroic. The whole symphony sounds like a struggle which starts from those four notes. People have often said that those four notes represent fate knocking at the door. By the time we get to the last movement (the finale) the music has become major instead of minor. It sounds as if Beethoven has overcome his depression. The fourth movement of this symphony is one of the first times a trombone or a piccolo is used in a symphony. This page was last changed on 20 February 2018, at 21:58.